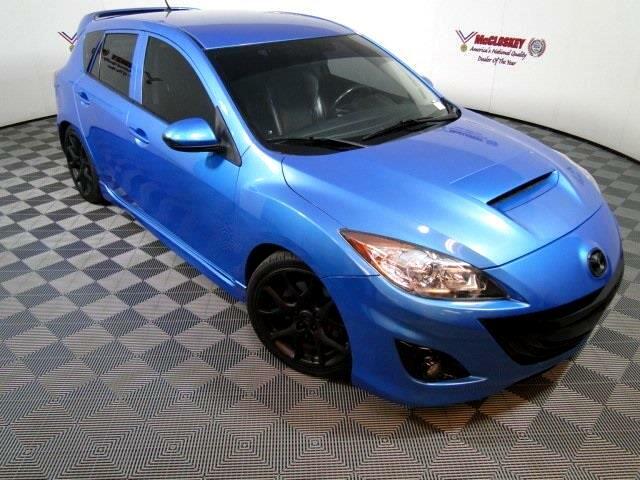 Sporty 2010 Mazda 3 MazdaSpeed Sport with Navigation System, Custom Exhaust, Premium Wheels, Manual Transmission, Turbocharged 2.3L Engine! Standard equipment includes 18-inch alloy wheels, high-performance summer tires, a limited-slip differential, foglights, full power accessories, cruise control, keyless entry, dual-zone automatic climate control, front sport seats, leather and cloth upholstery, a leather-wrapped steering wheel and shift knob, a digital turbo boost gauge, Bluetooth phone and audio connectivity, and a six-speaker stereo with CD player, auxiliary audio jack and steering wheel controls. The Mazdaspeed 3 is powered by a 2.3-liter turbocharged four-cylinder that produces 263 hp and 280 lb-ft of torque. All that thrust is sent to the front wheels through a six-speed manual transmission equipped with a limited-slip differential. This vehicle passed our 110 multi-point inspection and is backed by our National Quality Dealer of the Year Award. We are an ''A+'' Better Business Bureau Rated Business. We offer low interest rate financing, low down payments and the highest trade allowances in the state! Here at McCloskey we do things a bit differently, we shop our competition every day to ensure a great value to you. Come on down and experience it for yourself. This McCloskey Assured vehicle includes a 2 month/2000 mile Warranty and a Vehicle History Report!! At McCloskey we strive to provide ASSURANCE, TRUST, VALUE AND QUALITY! Call 719-434-4492.